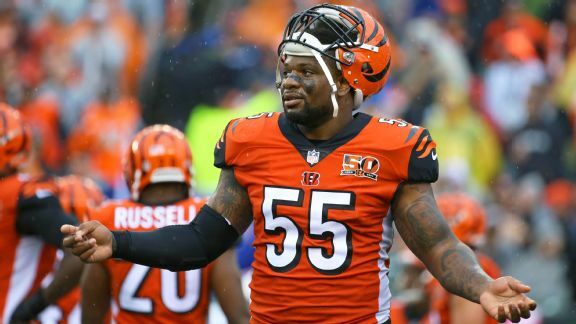 CINCINNATI — The Cincinnati Bengals made the correct move on Monday to release veteran linebacker Vontaze Burfict. Five years might be an exaggeration, but the Bengals certainly would’ve been in a better position if they had prepared for the future and drafted Burfict’s replacement instead of handing him a contract extension in 2017. Now the team is left with a large hole to fill at a position that struggled in 2018. The Bengals sat out the wave of massive linebacker contracts to start free agency, suggesting that Burfict’s exit could pave the way for the Bengals to select a linebacker with their first pick for the first time since taking Keith Rivers No. 9 overall in the 2008 draft. Perhaps nostalgia played a part in keeping Burfict around. When he was at his best, he was a brilliant linebacker, capable of quickly diagnosing an offense and barreling over players with his 250-pound frame. He helped the Bengals reach the playoffs each season from 2012 to 2015. At his worst, he was unreliable and unavailable, and from 2014 to 2018, he missed 37 games. That Cincinnati held on to Burfict wasn’t surprising. Although he quickly developed a reputation for dirty play and said he wouldn’t change his style, it’s clear the Bengals felt they could rein him in. In some ways it did seem like he was trying. Bengals coach Marvin Lewis said he yelled at Burfict for missing a tackle during a preseason game in 2017, to which Burfict replied he was just trying not to make a hit that could get him penalized. Burfict was indeed suspended for a hit against the Chiefs the following week. In other ways Burfict seemed to grow even more defensive, as he repeatedly found himself in trouble with the league. In fact, his last three seasons were more defined by those issues than anything else. The NFL handed Burfict suspensions to open the 2016 and 2017 seasons for violations of player safety and another one in 2018 for breaking its PED policy. He was fined $75,000 for stepping on Patriots running LaGarrette Blount in 2016. He was fined more than $100,000 in one game for his play against the Steelers in 2018. It was clear his act was growing tired by last season. He was making one of the top salaries on the team and his play wasn’t living up to his contract. Even Lewis seemed to grow weary of answering questions every time Burfict entered the NFL’s crosshairs. The Bengals could have lived with all of it if they were winning and Burfict was playing well. But the Burfict of 2015 seemed to have disappeared. A 45-10 blowout loss against the Chiefs in late October illustrated that when he missed tackles, stopped to get in Travis Kelce’s face while a play was still going on behind him, tried to draw a foul by flopping and eventually left in the third quarter with an injury. Lewis appeared to choose his words carefully when asked about Burfict’s play a few days later. “He hasn’t played as well as he has in the past,” he finally said. When pressed to follow up, Lewis shut the discussion down. “I don’t want to talk about Vontaze. It’s not relevant,” he said. A source said Burfict expressed to Lewis later that day that he was unhappy with his comments. But as one former Bengals staff member pointed out, the tape on the Chiefs game said it all. “He’s not relevant,” the source said at the time, noting that Burfict not only had played one of the worst games of his career, but he appeared to be "loafing" as well. It wasn’t the only time that season someone would accuse Burfict of not giving 100 percent at times. An opposing player said Burfict’s film against the Steelers shocked him. The players couldn’t believe what they were seeing during one particular play, rewinding it several times and laughing. Burfict’s teammate Dre Kirkpatrick fell trying to make a tackle, forcing a running Burfict to adjust as he stepped over him. Burfict immediately pulled up and looked at Kirkpatrick while James Conner ran down the sideline for a 25-yard gain. Perhaps Burfict was worn down from years of being scrutinized by the league, or perhaps his play suffered along with everyone else’s due to the revolving door at defensive coordinator, from Paul Guenther in 2017 to Teryl Austin and eventually Lewis in 2018. Maybe years of injuries, including microfracture surgery in 2014, simply caused him to lose a step. Whatever the reason, those incidents, combined with hip issues and a scary amount of concussions in a short period of time, likely contributed to his exit. It didn’t help that his biggest supporters in Guenther and Lewis were no longer around. While Burfict sometimes made Lewis want to pull his hair out, Lewis also saw Burfict as a "big kid" and supported him as if he were his own son. The signs have pointed toward the eventual end of Burfict’s tenure in Cincinnati for months. It’s hard to believe in some ways, considering just three years ago Burfict was approximately 90 seconds away from being the hero of the Bengals’ first playoff win since the 1990 season. While Burfict’s detractors will always remember his unnecessary roughness penalty and last-second meltdown to lose the 2015 AFC wild-card game against the Steelers, his supporters will remember something else. In an alternate universe, perhaps Burfict is known as a legend for his game-sealing interception with 1:36 to play that day. To his supporters, that title should have been his. Before the Adam Jones altercation with Steelers coach Joey Porter, before the Jeremy Hill fumble, they’ll remember Burfict with the ball in his hands, running all the way into the bowels of Paul Brown stadium with a number of grinning teammates running behind him. For a few years, Burfict was the heart and soul of the Bengals' defense. But as it turns out, that interception would be the peak of his career. Burfict just couldn’t change enough in a league that was rapidly changing around him. And when his play stopped living up to his once-fearsome reputation, it was clear the team no longer felt he was worth the baggage.